In compliance with God’s command Baligh maa onzila ilaik-‘ (5:67) the Holy Prophet had inaugurated the serial of Irnamate’ (Divine guidance in succession to the Final apostleship) and had placed Au as the First in charge of it, and had declared it at the historic ceremonial event at Ghadeer-e-Khum, before the multitude of the thousands of the Hajies, on x8. 12.10 A.H. at the conclusion of which event was revealed 5:6… declaring the religion to be perfect and Islam to be the religion for man, accepted by God. In pursuance of the expressed divine will of the Lord, Au could not recognize or yield to the man-made authority set up at the Saqeefa’ and hence had not paid fealty to it. The holy Prophet who knew through the divine gift of knowledge, as to what would happen after him till the Day of Judgment, had advised Ali to exercise the maximum possible patience against every atrocious move that might confront him. In compliance with the apostolic will, without the least interference into, or any concern with the affairs that proceeded at the Saqeefa’, Ali had retired with a determination not to get out until he collects together all the notes on the Holy Qur’an which he had from the Holy Prophet about the external as well as the internal meanings of the Final Word of God. 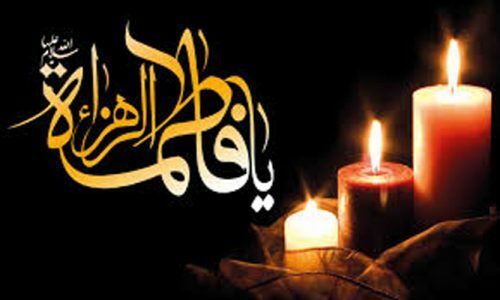 Without Ali being subjugated, the authority set up at the Saqeefa’ could not have the seal of the recognition of it, by the Holy Ahul-Bait and Ali was now the Chief of the Ahlul-Bait, the House of the Holy Prophet, and he would not yield. The retirement of Ali was exploited and a charge of conspiracy was coined and the people of the newly set up rule, headed by Omar, collected at the door of Fatema, demanded Au to come out of the house. The reply from inside was that it was a vow Au had made not to come out until the collection of the important notes on the Holy Qur’an is not completed. But the insurgent crowd would not agree and a big row was set into action. “O’ people! it is only yesterday that my father, the holy Prophet, departed from you and today you have the audacity to attack his house in which his daughter is mourning for him, which door he did not enter but with a salutation on its inmates”. A violent kick at the door from one among the crowd pushed it down on the side of the Holy Lady Fatema standing behind it, breaking her rib and the Khatoone Jannat’ the Queen of Paradise, fell unconscious and ultimately the hit and the wound killed the Holy Mother along with the baby son in her womb. According to the tradition of the Ahlul-Bait, the Baby was already named Mohsin.